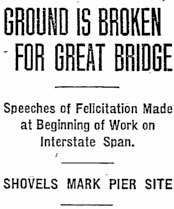 Construction of the Interstate Bridge connecting Portland, Oregon and Vancouver, Washington began with dignitaries displacing ceremonial shovelfuls of Hayden Island sand on March 6, 1915. It was a time of congratulations, following a long campaign for the bridge that has covered a period of years. Among the speakers were men who have been working since the inception of the project, and that their efforts have proved successful was said to mark a new and greater epoch in the development of both states. The bridge opened on February 14, 1917 (Morning Oregonian, 15 February 1917). A trolley trial run was conducted on January 24, 1917, and the streetcars ran regular between Portland and Vancouver until the 1940s. The original span carries traffic northbound and traffic flows south on the newer, 1958, span.